Funding for specials teachers in NC elementary public schools has been in the news a lot since the legislative long session began in January. Specials teachers include art, music, world languages, technology and PE teachers. The money for these teachers is not included in the state funding allocated to school districts, but they have used the flexibility permitted them to stretch their teacher allotment money to extend class sizes across grades which allowed them to provide specials teachers/programs. When the NCGA changed the rules last year taking away the flexibility, without providing additional funds, many school districts reported that laying off these teachers was the only way they could afford to hire additional K-3 teachers needed to meet new class size requirements. Members of the House came to the rescue, passing HB13 unanimously in February so that school districts would have more time to find new teachers and add additional class room space. The Senate amended the bill last week, the House concurred and >>it was signed into law . HB13 allows school districts to phase in class size requirements over the next two years and allows them to keep using teacher allotment flexibility for 2017-18 only, thus avoiding losing their 5,500 specials teachers for now! HB13 as amended by the Senate will lower maximum K-3 class sizes for this fall to 23 students. In the 2018-19 school year, maximum K-3 class sizes would range from 19 to 21 students. Also in 2018, average K-3 class sizes for districts would drop to between 16 and 18 students, compared to 21 this school year. 1) Finding new teachers. School districts will need to find thousands of teachers who are certified and experienced for these new classes starting next year. Without a serious effort, one that is way beyond the current proposal to reinstate the Teaching Fellows program, school districts across the state are likely to see significant shortages in licensed elementary school teachers next year and for years to come. We need a strong short- and long-term plan along with waivers for some school systems to implement the new class sizes over 3 to 5 years instead of just two years. School districts will have to recruit and retain teachers better than ever and the NCGA will have to help. NCGA must reinstate programs like Teaching Fellows and provide other more expansive tuition reimbursement/enhancement programs, provide better pay and benefits, reinstate employment rights, and improve other working conditions to keep teachers and lure many back to the classroom. This is not a quick fix. In addition, the immediate need for more teachers created by this requirement will exacerbate the current competitiveness among school systems. Counties that pay better supplements or offer better benefits (better working conditions) will be at a significant advantage. Neighboring school systems will be prime recruiting grounds to help them hire the teachers they need to meet the state statue. The schools systems that are unable to compete in attracting experienced, qualified teachers will be faced with constant turnover and year-round use of substitutes in their class rooms. The teacher pipeline is not looking good for the next four years. Public and private Schools of Education in our state are reporting a 30% decline in students choosing teaching as a career. 2) Creating new class rooms. 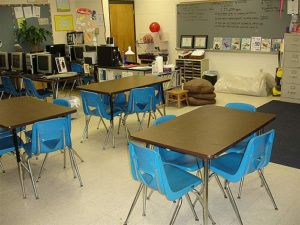 The lower class sizes in K-3 grades will increase the number of K-3 classrooms needed. This is a serious issue for many local school districts across the state. Over the next few months, local school boards will need to examine ways to increase the number of classrooms they need next year and beyond. Renovating current space or building new schools will require additional capital funds from local revenues, mostly from increasing property taxes. It will take time to raise the money and construct the space. The short-term alternative to the newly required space needs could be to increase class sizes in grades 4-12 to free up class space, using undesirable space such as lunch rooms or sharing space (putting two teachers and their classes into one room). We hope that as school districts determine their needs that NCGA members will reconsider the implementation schedule on a case-by-case basis allowing large districts a longer phase-in period to deal with capital needs. Stay involved with your local school district as this issue develops over the next 4-6 months. Encourage your school board to resist larger class sizes in grades 4-12 as a solution. Keep talking to your NCGA representatives about restoring class size caps in grades 4-12. 3) Funding Specials. Funding for 2018-19 specials teachers was not included in HB13. The good news is that when senators passed the amended HB13, they pledged to supplement with new funding for specials (enhancement) teachers in 2018 when class sizes will be lowered again. Without this supplemental, new funding, school districts will be right back in 2018 fighting the same battle for adequate funding to keep class sizes at required levels while keeping their specials teachers. NEXT STEPS: It is critical to ask our Senators to fund “specials” teaching positions now. This year, the Senate goes first in presenting the 2017-18 – 2018-19 biennial budget and House members have signaled that they will support adding this expenditure! It is not fair to let these teachers worry for another year about having a job! And it is not good business practice to hamper local school districts’ fiscal and space planning activities for another year. School leaders should not have to choose between class size and offering a robust well-rounded education for all children. Ask Senators to put the estimated $325 million in their proposed 2017-18 – 2018-19 biennial budget under development now. Ask them to fully fund our specials and invest in our children! Let’s put education FIRST in the budgeting process this year! Instead of giving more tax breaks for corporations and high income groups, let’s restore our state funding to at least pre-recession levels to alleviate unfair choices like HB13. After controlling for inflation, school districts are getting about $600 less per student than they did in 2008. If Wake County’s school system were getting $600 more per student this year, there would be an additional $96 million to spend on specials, teacher assistants, social workers, counselors, and textbooks! BOTTOM LINE: NC ranks 43 rd in the nation for per pupil spending. Raising per pupil expenditures (PPE) is the top need of our school districts this year. Our legislators provide about $3,000 less per student than the national average and we are at the bottom when looking at money spent per student in other Southern states. Not only do we need to increase per pupil expenditures, we need to allow local school boards and their superintendents the flexibility to use funds in ways that best meet their students’ needs. Our legislators have been micro-managing districts and this does not allow locally elected officials on the school board, city councils and county commissioners the flexibility they need to best serve their unique student populations. Public Schools First: Supporting public schools through information, education, and engagement. We are a statewide nonprofit, donations are tax-deductible.